Rich in fine arts and handcrafted product, the Manning Valley has a wide range of natural attractions. The Manning River itself is extremely rare, being Australia’s only river delta system with two river entrances, located at Harrington and Old Bar. Visitors can boat, ski or fish on 150km of navigable waterways. From forest walks to natural swimming holes, beaches, local craft galleries, cosy tea-rooms and fine restaurants, the Manning Valley has a wealth of delights to offer its visitors. See below for Maurie and De’s personal recommendations. Or visit the Manning Valley’s official tourist website. 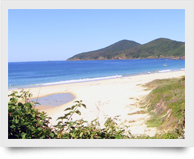 For the beach lovers, Saltwater Beach and Wallaby Point are only a 20 min drive from Nundoobah. Saltwater Beach and lagoon has a great picnic/BBQ area and facilities if you want to make a day of it. A 30 km drive north-east of Nundoobah is Crowdy Bay National Park, a rugged coastline of cliffs, rockpools, beaches and forests. Crowdy Head is one of the park’s great surfing beaches and an excellent place to go for a long beach walk. Crowdy Head is a working fishing village and has a great fish co-op for lovers of seafood. Diamond Head, the highest point in the park, is an absolutely stunning spot – a must for the avid snorkeller – with a camping ground and BBQ/facilities. Hallidays Point, known locally as Blackhead Village, is a 30 minute drive from Nundoobah Retreat and has one of the best surfing beaches in the area. The small shop opposite the main beach sells take-away food and also has a liquor license. Enjoying a glass of wine in the nature reserve adjoining the beach is thoroughly recommended. Brimbin Reserve, 10 minutes from Nundoobah by car (or 30-45 minutes by kayak, row boat or water bike) is a beautiful nature reserve set on 50 hectares overlooking the Dawson River. The Reserve has significance for the local Biripi people, the name “Brimbin” coming from the Aboriginal word “Borembit” meaning stringybark, a tree that features in the area. There are picnic and BBQ facilities, and two lovely walking tracks. The village of Harrington is at the northern mouth of the Manning River, just south of Crowdy Bay. This is the fisherman’s dream, offering estuary, beach and breakwall fishing. There are a number of picturesque walking trails – the breakwater is a must. Harrington is also an excellent spot for indulging in fresh local seafood. A visit to the riverside Harrington Pub (Ph: 6556 1205) for lunch (or a casual beverage or two) is definitely a worthwhile expedition. Or experience the true Irish atmosphere of Harrigan’s Irish Pub (Ph: 6556 0555). Alternatively, pick up some fresh oysters or prawns from Stones Oysters (Ph: 6556 3222) on Harrington Rd at Coopernook. Manning Point, on Mitchell’s Island just south of the Harrington Inlet, is home to Manning oysters. There is estuary, beach & river fishing and a good surf beach. Dolphin-watch from a balcony table at Manning Point Marina while enjoying a Devonshire tea, lunch or dinner outdoors in a tropical garden setting. Just a 15 minute drive north of Nundoobah is the historic oyster-farming village of Croki, another great fishing and swimming stop. The long breakwall is good for fishing or a just a stroll. Wingham, just a 10 minute drive north-west of Nundoobah, is a peaceful, charming little river town. Laid out in traditional English style, Wingham has many fine examples of Federation and Victorian architecture. Wingham Brush represents part of the last 10 hectares of sub-tropical floodplain rainforest in NSW. A raised boardwalk starts at Farquar Street and guides you through this rare nature spot, featuring giant Moreton Bay figs and flying foxes. Lunch or high morning tea at Bent on Food is highly recommended (see ‘Dining Recommendations’). Newby’s Lookout, about 30 kms north of Nundoobah, offers a magnificent view over the Manning Valley. A great place for observing sea eagles, wedge tail eagles and other birdlife. Waitui Falls on the road to Hannam Vale (about 35 kms to the north from Nundoobah) is a Forestry waterfall and swimming hole with a picnic area and facilities. On the way, stop at Moorland Cottage (Ph: 6556 5248) on the Hannam Vale Road for a homemade devonshire tea. Ellenborough Falls is about a 40 minute drive from Nundoobah via Wingham. These falls are a spectacular site (see gallery) as they plunge from plateau level into a vertical walled box gorge 160 metres below. Walk to the bottom (but save some energy for the hundreds of steps back up). BBQ’s, picnic tables, drinking water and facilities are provided. Dingo Tops Forest Park, although a little further away (approx 50 kms from Nundoobah via Wingham and Wherrol Flat), has a couple of fantastic walking trails through virgin hardwood and rainforest stands. Many native trees border these trails, including some large red cedars. There is a picnic site. The Comboyne Plateau, also a bit of a drive from Nundoobah (approx. 1 hour) is a beautiful piece of countryside; a cultivated English landscape on the top of a mountain. The gravel road to get there has many twists and turns (not for the faint-hearted) but the experience is well worth it. The peaceful village of Comboyne has delicious lunches, treats and coffee. Real country fare surrounded by green rolling hills. Tinonee, just 15 minutes from Nundoobah, is the arts and crafts centre of the Manning Valley. Memories Cafe & Craft (Ph: 6553 1143) is a national trust listed house overlooking the Manning River, selling Manning made crafts and wonderful food. Open Sun 8am – 4 pm, other days from 10am – 4 pm. The Deep Water Shark Gallery (Ph: 6553 1093), between Tinonee & Wingham, is well worth a visit. The gallery is owned and operated by Russell Saunders, an elder of the Biripi people, who is responsible for the magnificent carvings and other examples of Aboriginal art around Nundoobah Retreat. Ask Russell to demonstrate his skill on the didgeridoo or ask to meet his daughter Rachel, whose carvings and artwork are also on display. Artisans Retreat, just minutes from Tinonee at Mondrook, has a gallery displaying and selling artworks, including wood carvings, glass works, metal sculptures, silk paintings and jewellery. A beautiful setting, surrounded by green dairy country. There’s also a cafe. Manning Regional Art Gallery (Ph: 6592 5455), located in Taree, welcomes visitors to view and occasionally purchase some of our regions finest art. The Gallery curates more than 12 exhibitions each year. Hours as at 2011: Wed to Sat 10am – 4 pm. Sun 1pm – 4pm. The Other Side Gallery Tea House (Ph: 6553 8890) overlooking Ghinni Ghinni Creek (15 minutes form Nundoobah) displays beautiful artwork and makes a mean honeycomb and butterscotch pancake. Resident portrait artists work and teach in the upstairs studio. A real treasure. (Ph: 6554 3162), about a 30 minute drive from Nundoobah, offers scenic trail rides for beginners through to experienced riders. You can request a guided private ride for couples. The 40,000 acre property takes you through endless rainforest in the heart of the Kiwarrak Forest. Manning River Aero Club (Ph: 6553 9301) offers a number of different joy flights over the Great Lakes and Manning districts. The National Motor Cycle Museum (Ph: 6554 1333) in Nabiac, 20 minutes from Nundoobah, is a private museum with a collection of over 700 motorcycles, many of which are extremely rare. Also on display are old toy motorcyles and motorcycle memorabilia. $12 entry for adults.